On the MWC 2017 the Dutch company Sitecom presented its WLAN stations Huddle . These should make the home WLAN more stable and easier to use: with a system that recalls multiroom speakers. Impeccable WLAN in the living room, miserable connection in the bedroom - not unusual, if the wireless hotspot is far away from bedroom. The solution: several hotspots in the entire living area. 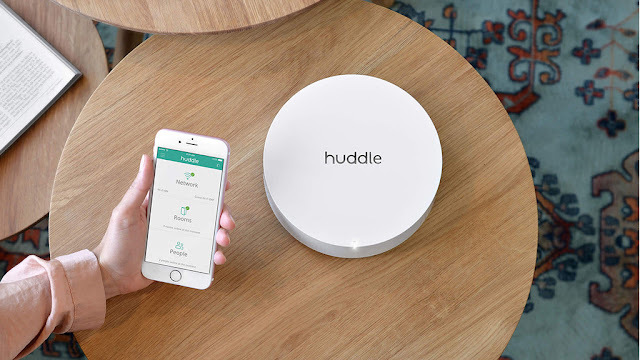 This means, however, that you have to connect to the individual hotspots each time - in case of doubt, then the reception will break when moving through the house, for example during the movie or video chat. The problem is to solve Sitecom with huddle . The manufacturer promises that with the system connection breaks are a thing of the past. Smartphones or tablets are supposed to switch automatically from WLAN stations, the huddles, to the strongest signal. If a connection is terminated, the device automatically searches for a more detailed WLAN station. This, so promises Sitecom, is supposed to work so well that even a Videochat is possible on the way from the cellar to the attic. The installation of the system should be very easy: An app regulates that for the user. It also takes care of the management and control of the system. Standard features such as time control, web page filters and guest networks have Huddle on board. An exact date for the delivery date of the WLAN stations is not yet - but it will soon be so far. Those interested can Huddle preorder . In the base variant with two stations the system costs 349 euros, for 499 euros there are three. Each additional station costs an additional 199 euros.